Last week, after months of growing street protests, detentions, escalating violence, at least 36 deaths, and shortages of almost all basic necessities, Venezuela’s President, Nicolas Maduro, announced the creation of a constituent assembly with the ability to re-write the country’s constitution. 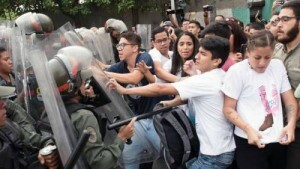 Irrespective of which version one believes, or to set aside the view that a humanitarian crisis is being manufactured to bring about regime change, it is to observe that whatever the outcome, those who continue to suffer most are the Venezuelan people. It is becoming clearer that the rapidly deteriorating internal situation in Venezuela has consequences for its neighbours. Within Caricom significant divisions have emerged about the extent to which countries should respond. At the same time concerns have begun to emerge about the effect on regional stability if a refugee crisis were to occur. These divisions became apparent on April 26 at a meeting of the Organisation of American States (OAS) which approved a resolution to convene a meeting of OAS Ministers of Foreign Affairs to consider the situation. Venezuela and countries that support its position sought to have the motion rejected. However, the Bahamas, Barbados, Jamaica, Guyana, and St Lucia, voted in favour, together with the US, Canada Argentina, Brazil, Chile, Colombia, Costa Rica, Honduras, Guatemala, Mexico, Panama, Paraguay, Peru, and Uruguay. Antigua, Dominica, Haiti, Nicaragua, St Kitts, St Vincent, and Suriname, voted against with Venezuela, Bolivia and Ecuador, while Belize, the Dominican Republic, Trinidad and Tobago and El Salvador abstained. Grenada was absent. Unfortunately, there may now be other more human consequences. Firstly, in several of Venezuela’s neighbours, including T&T, Guyana, Curacao and Brazil, there is concern that the crisis now unfolding may increase the number of Venezuelans seeking to flee their country, triggering a refugee crisis. Already in T&T there is a growing presence of Venezuelans in villages in the central, south and south-west of the country, and evidence that criminal trafficking networks are emerging, offering transport, documentation and safe houses to those who can pay. Separately, other neighbours like Guyana are concerned about the possible impact of instability on the international dimensions of their unresolved territorial disputes. Whether governments choose to admit it or not, some are hopelessly compromised as holders of Venezuelan debt under the PetroCaribe arrangement, and by promises of future investment. In contrast, others are aware that for reasons of real politick relating to future relations with the US that there is value in backing the desire to Maduro go. Thirdly, in some quarters in the US there is a view that Venezuela could, with hemispheric support, become a tool to engineer other changes in the Americas. It is already the case that Venezuela’s deteriorating economic situation has in part forced Cuba into new period of austerity and economic uncertainty. Fourthly, whatever happens in Venezuela is likely to affect the posture of China and Russia in the region. Russia sees Venezuela as a strategic ally in the Americas and is likely to defend its position. China, in contrast, sees potential economic opportunity, but holds significant amounts of Venezuelan debt, largely repayable in oil and other forms of investment. And fifthly, what happened at the OAS last month makes clear that important future choices will now arise as to the best future vehicles through which the nations of the Americas try to resolve political differences. The response to the crisis illustrates how debt and short termism has led Caribbean governments to be conflicted. It also suggests how little long-term thought has been given beyond the region as to what might happen if Venezuelan largesse were to dry up. There is a danger that the crisis now emerging may encourage the US, once again, to challenge the independence and sovereignty of the nations of the Americas.